This is what we were experiencing when we were heading towards the temple at the base of Gorakshanath fort after finishing hike on Katra Fort and its adjacent mountains. Such were the circumstances of the day that our original plan had to be altered and instead of spending night in the temple on top of Ankai Fort, temple at the base Gorakshanath Fort was our halting destination for the night. 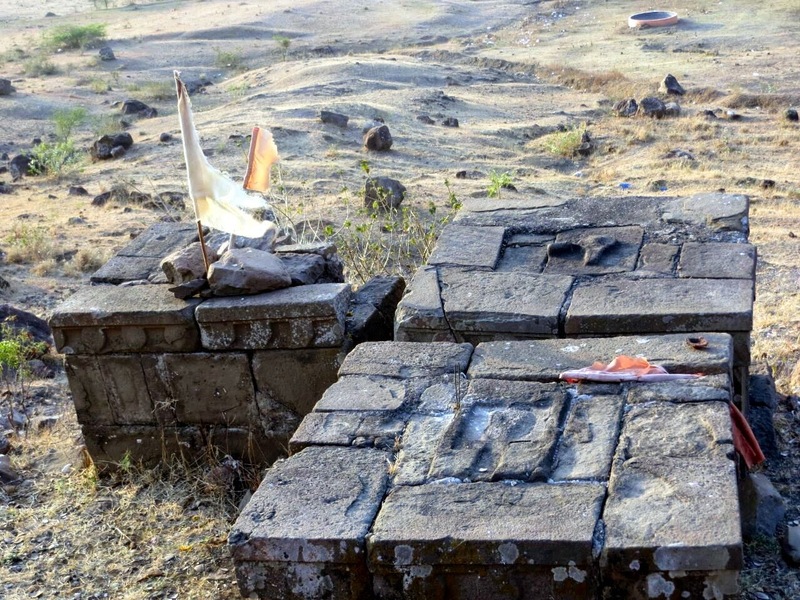 We plied our car from Visapur village to Ankai and after certain distance, took a left turn on the dirt road going towards the base of Gorakshanath Fort. It was a bumpy ride at some stretches. Soon, we were at the base of the fort. As soon as, we switched off the car engine, devotional songs played in the temple started hitting our ears. Couple of us went ahead to check whether temple was alright for night's stay and after confirming, we pulled out all our backpacks and headed towards the temple. A small, temporary tent was hoisted in front of the temple and a small bulb was hanging on top of it. With the gushing winds, tent was shaking and bulb was shaking with it. Sadhus were perching at one side smoking chillums, a small chullah was lit and rice was getting cooked inside a big pot. Initially, we did not feel comfortable seeing so many saints under the spell of chillum but soon our fears were put to rest when main caretaker saint ordered his disciples to prepare tea for us. Soon, Masala Tea was served to us and we got much needed warmth as the temperature was dramatically dropped and we had just begun to shiver. As we started talking to main saint of the temple, we got to know that all other saints were guests just like us. Festival over the period of nine days was underway and there was free food for all the guests visiting the temple. As we had gone to stay in the temple, we were also guests and entitled to have free food. Though we were carrying raw material for dinner preparation, we readily agreed to have dinner that would be served in the temple as prasad (sacrament). Everyone was already exhausted by day's hike and felt elated by the invitation to eat ready-made food. Soon, mats were laid on the floor and it was time for dinner. All saints and all of us sat next to each other and couple of boys served the hot dinner of Khichadi and Shira.Dinner turned out to be very sumptuous; everything about it was perfect and all of us feasted on it. After dinner, we gathered in a small room and started chatting. Soon, our local friends who were our guides also came to the temple. "Friends, should I ask you something? You didn't demand any fees from us". "No fees. We were also hiking on this trail for the first time and we misguided you most of the times instead of guiding you." With this, we burst into peal of laughter and whole episode of day's hike unfolded quickly in front of our eyes. As we had nothing better to do, Vishal entertained us by doing some mimicry and we really enjoyed seeing the talented Vishal performing. Gradually, fatigue started setting in and eyes became sleepy and main caretaker asked us to shift in another room which was warmer. By this time, some saints were already sleeping blissfully under the tent oblivious to the freezing cold outside. We were happy with the idea of spending night in the warmer room. There was a Saint already sleeping in the room and he seemed to have slept peacefully. Room was not big enough; but enough to accommodate 6-7 people. After a while, few of the trek mates went into the trance and started snoring. I along with Sameer were still awake and getting disturbed by the snoring and decided to sleep outside. But only after couple of minutes, we were again back in the room as it was freezing cold outside. Gradually tiring bodies went into deep slumber ignoring the rhythmic snoring around and sprung to life only when alarm started ringing around 5 in the morning. We did not have much time to waste as we had to hike on three more forts and do the travel of 250 Kms back to Pune. Everyone was up by 5.30 am and after finishing early morning chores, Saint prepared Tea for us and asked Vishal, 13 yrs kid who stays very near to the temple to take us to the fort. It was just before the dawn and sun was preparing to rise from the distant horizon. Once we had sufficient light, we started our hike. Ascent to Gorakshagad is from the Southern side. Trail starts from the temple itself and there are well-laid steps at the beginning. You come across some stone structures on the way. In about 20 minutes, you reach to the base of vertical cliff where there are many rock-cut caves; one of them hosting Gorakshanath Temple. Sun was just beginning to rise from the right side of Ankai Fort and we huddled together to watch this beautiful moment from the easternmost part of the fort. Amol was perching under the cliff and golden rays on the cliff provided a spectacular sight. There was a talk of exploring the traverse on the North side (we came from the South side) but as per our little guide, it was very narrow and risky. So we decided to return from the traverse from where we had reached to the Eastern side of the fort. We continued on the same traverse to explore other attractions of the fort. Gorakshanath Temple hosted in the cave: Saint from the temple we halted at night daily worship and light a diya here. There is also a water cistern in the cave with an idol behind it. There is also a deep cave where many idols are placed. This cave is very deep and closed by a gate. There was an option of going on top of the fort but as there are no remnants on top, we decided to skip it and started descending. After descending, we spent some time near the big banyan tree at the base where Tushar and Amol took the swings by holding the branches of the tree and they were so happy living their childhood again. It was time for breakfast and we headed towards the temple taking bread, jams, sandwich spreads along with us and shared it along with all saints in the temple. We were carrying multigrain breads with different spreads -- orange jam, pudina spread and carrnot-cucumber sandwich spread. We made experimentation of applying all the spreads simultaneously and it didn't taste bad. Probably Saints were eating multi-grain bread for the first time and seemed to be enjoying the breakfast unusual for them. Inside the temple where beams of early morning rays swarmed with dust at slanting angle provided nice photography effect. Main caretaker of the temple who took very good care of us. He parted with his chillum for a while when I was taking his photograph. Another saint gave his blessings as we started to leave. Finally, it was time to move on to our next destination -- Ankai and Tankai and with a heavy heart, we bid adieu to our companions with whom we spent a memorable night. These strangers really treated us kindly and provided us with a lot of fond memories! "What circumstances led them to take the path of sainthood abandoning their families? Do they miss their families? Do they sometimes have the temptation to go back to their families or is it too late? Was it the choice or circumstances forced them on this path?" These flurry of questions flooded my mind as we started proceeding towards Ankai-Tankai forts.